We have a new florist shop in our neighbourhood mall, I went to check it out to see if they have more variety of flowers at a cheaper price. I was slightly disappointed to find that there are a handful of flowers with the usual chrysanthemums. It was however the 2nd day of its operation so I am hoping that the shop owner have not got his flower stocks yet. My 3 stalks of champagne roses with a 2 stalks of the purple flowers cost $9; $2 for each stalk of rose and $3 for the purple flower, kind of expensive to me. I brought the small bouquet home, was looking around to find a container to put them as my vases are all too big for it. 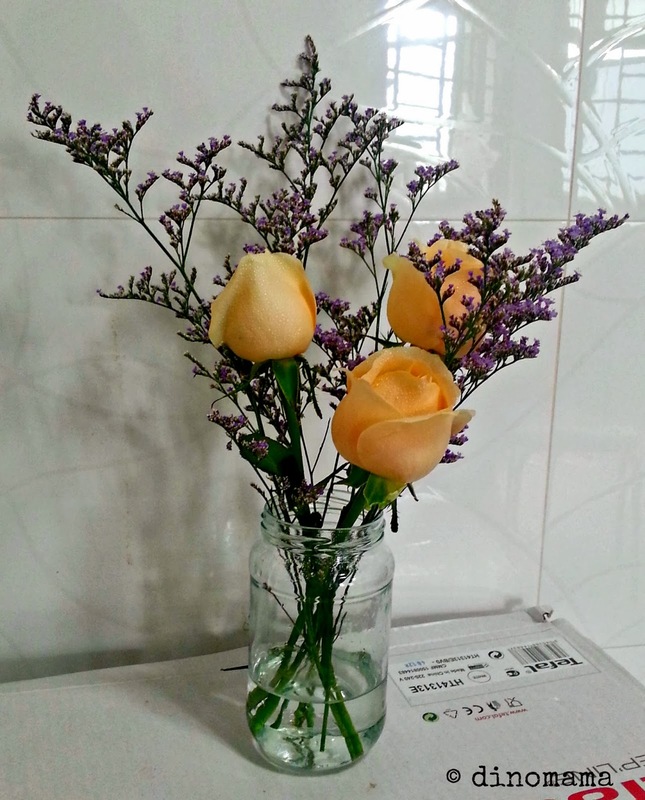 I saw my mason jar on the kitchen counter and without second thought I grabbed it and put my small bouquet in it. They look beautiful don't they?